Luke Paddock has been training like a ‘beast’ as he sets his sights on a version of a world title. The Bloxwich boxer (18-2) challenges Glossop’s Adam Hague (11-1) for the IBF Youth Lightweight Title at Walsall Town Hall on Saturday, 15th October. 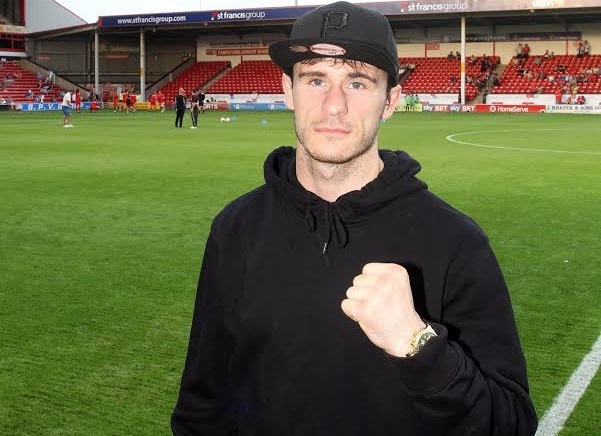 The 25 year-old has endured a grueling camp ahead of his clash with Matthew Hatton trained Hague at the top of BCB Promotions’ ‘The World Awaits’ show, sponsored by Grosvenor Casino Walsall and Bailey & Mackey Ltd. Morning sessions at fellow sponsors The Village Hotel Walsall have been followed by grueling sessions with BCB Head Trainer, Paul Mann, and a series of spars with his stablemates. Paddock hopes his hard work will pay off and he will realise his dreams in his hometown next weekend. “Camp has been intense,” Paddock told bcb-promotions.com. “I’ve been doing spin classes with Personal Trainer, Dan Kibby, at the Village every morning before training with Paul (Mann) at the gym. My fitness and weight is spot on. I feel great but that’s because I’ve not cut any corners. I’ve trained like a beast. “This is a chance to win a legitimate title and build by ranking at world level; I’m leaving no stone unturned. “It’s been tough; the toughest camp of my career. But that’s how it should be as this is the toughest fight of my career. “The spin sessions have been hard but enjoyable. It’s a good way to build up my endurance and it means I have a good fitness base to work from. Paul (Mann) beasts us with his sessions too and there’s no hiding from those circuits! “What it means though is that, by the time it comes to my technical work, game plan and sparring; I have enough in the tank to implement them properly. Redditch middleweight, Andrew Robinson, Birmingham super welterweight, Jordan Clayton, Birmingham heavyweight, Nathan Stevens, Cameroon and Swizerland light heavyweight, Emmanuel Moussinga, Tividale welterweight, Ryan ‘Stewart’ Davies, and Birmingham bantamweight, Ijaz Ahmed, all feature on the undercard. Tipton light heavyweight, Ricky Summers, no longer features as he concentrates on his Midlands Area Title showdown with Joe Sherriff at Walsall Town Hall on Saturday, 25th November. Tickets for ‘the World Awaits’ are priced at £35 general admission (£40 on the door) and £60 (VIP Ringside to include buffet and waitress service), and can be purchased by calling 0845 111 2900. Jamie Cox: The future is now, it’s time to capitalise!